Joël Robuchon is a French gourmet restaurant of French chef and restaurateur Joël Robuchon. The restaurant, located at the MGM Grand Las Vegas in Las Vegas, Nevada, was rated 3 stars in 2009 by the Michelin Guide, 5-stars by Forbes Travel Guide, and has been ranked by Wine Spectator and Travel and Leisure to be among the finest restaurants in the world. It was ranked as one of the Top 5 best restaurants in the United States by Gourmet magazine. The French cuisine is offered either as a prix fixe or an a la carte menu. The restaurant is well known for its exclusivity. There are 12 tables in the main dining room. 2007, Travel and Leisure "Best New Restaurant in the World"
2009, Wine Spectator "Grand Award"
^ Weston, Nicole. "Gourmet's Top 50 Restaurants 2006". SlashFood. AOL Inc. Retrieved 15 September 2011. ^ "Mobil Travel Guide: 2007 Five-Star Hotel and Restaurant Award Winners". Archived from the original on 2007-11-21. Retrieved 2007-11-12. 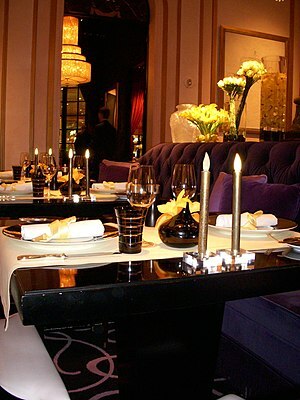 ^ "Joël Robuchon Restaurant at MGM Grand Receives 2009 Michelin Three-Star Award". VegasNews.com. Retrieved 24 June 2011. Wikimedia Commons has media related to Joël Robuchon (Las Vegas). This page was last edited on 3 March 2019, at 02:38 (UTC).